LARS HEDEGAARD: TERROR STRIKES COPENHAGEN ”AND IT’S THE DANES FAULT”…….. – The Tundra Tabloids……. LARS HEDEGAARD: TERROR STRIKES COPENHAGEN ”AND IT’S THE DANES FAULT”……..
Muslims perpetrate vicious crimes and they’re supposedly the victims of non-Muslim backlashing that never happens. In all likelihood, the politicians and the media will continue telling the Danes that they have nothing to fear from Islam. 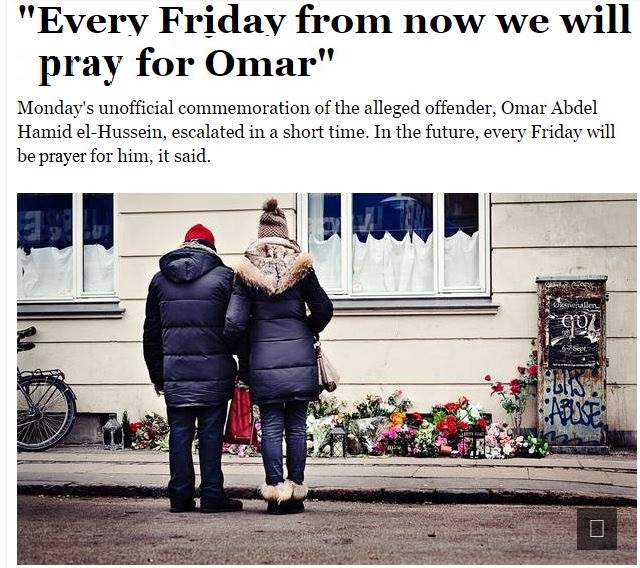 It did not take many hours after last weekend’s two fatal terrorist attacks in the Danish capital before the usual phalanx of apologists of Islamism went into action. Shortly after 3pm on Saturday, when 22-year-old Omar Abdel Hamid el-Hussein had shot and killed one of the guests attending a discussion on free speech at the Krudttønden cultural institute in Copenhagen’s Østerbro neighborhood, Prime Minister Helle Thorning-Schmidt arrived at the scene to express her sympathy with the families of the victim and the policemen who had been wounded in the firefight with el-Hussein. She also stressed the need for national unity in this time of horror. The discussion that came under attack was attended by the Swedish artist Lars Vilks — famous for his drawing of Muhammad as a roundabout dog, and probably the intended target — and the French ambassador. These questions are now being asked by a growing number of ordinary Danes, for example in social media; but so far no politician of any note has acknowledged any connection between terror, immigration, the build-up of Muslim parallel communities and Islam. Previous Post Previous Post FRENCH MOVIE ICON BRIGITTE BARDOT ON TRIAL AGAIN FOR BLASPHEMY……. Next Post Next Post ISLAMIC STATE KILLS 40 IN LIBYA WOUNDS SCORES MORE…….